OSCARS UPDATE: The shortfall for last night’s ACADEMY AWARDS presentation was even worse in time zone-adjusted numbers, with the ceremony only up to 10.8, down 2.3 points from 2014. Although a lot of the fault has to do with the arthouse nature of the major nominees, it’ll be interesting to see if the Academy and ABC go in a different direction from Neil Patrick Harris next time around. FRIDAY NETWORK UPDATE: The rebroadcast of NBC’s SNL40 special had an extra 0.1 in final numbers. FRIDAY CABLE: Discovery again had the top of the Friday cable chart, although this week it was ALASKAN BUSH PEOPLE (up 0.23 to 1.48) over lead-in GOLD RUSH (down 0.08 to 1.39). Adult Swim’s JACK & TRIUMPH SHOW premiered at 0.73, and the network stayed strong late into the night, with 0.49 for BAG BOY at 12;30AM and 0.43 (down a tenth from last Friday) for FISHCENTER at 4AM. ESPN’s NBA doubleheader was at 0.72/0.69. 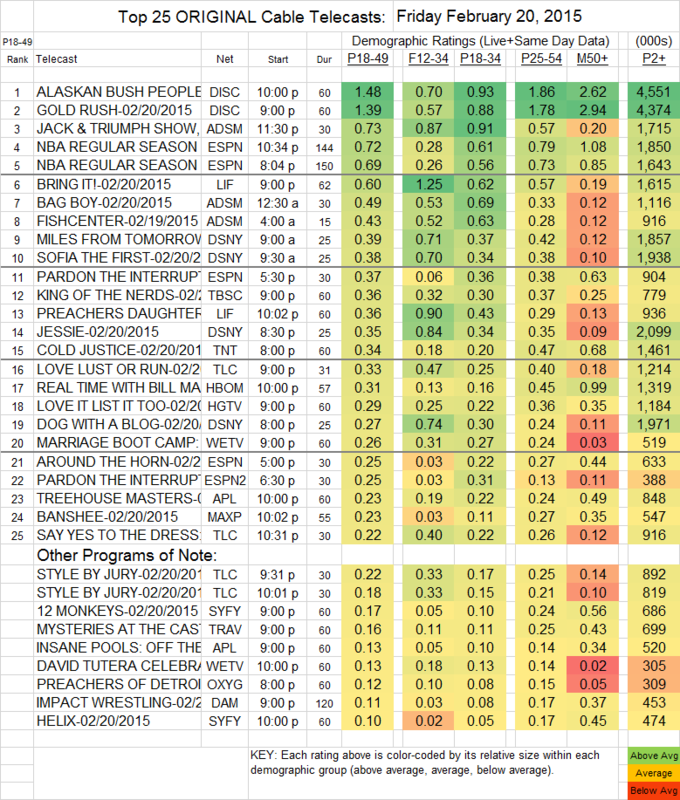 On Lifetime, BRING IT jumped 0.16 to 0.60, and PREACHER’S DAUGHTER was up 0.02 to 0.36. KING OF THE NERDS (TBS) held at 0.36. COLD JUSTICE (TNT) returned at 0.34. HBO’s REAL TIME WITH BILL MAHER was steady at 0.31. BANSHEE (Cinemax) was down a tick to 0.23. Syfy’s Friday continued to collapse, as 12 MONKEYS fell 0.06 to 0.17 and HELIX dropped 0.03 to 0.10. COMEDY BANG BANG (IFC), not on the chart, lost 0.02 to 0.01, with 26K total viewers. Here’s the IMPACT WRESTLING (DAM) lowdown: at 9PM, it shed 0.02 to 0.11 in 18-49s, although it was virtually even in total viewers (down 1000 to 453K), and its household rating was also steady at 0.29 (340K). The 11PM reairing added 0.03 in 18-49s, 124K total viewers and 0.09/102K in households.